For more information about the BioAssay Express, contact us at Collaborative Drug Discovery. Browse and group assays based upon meaningful, detailed criteria like cell type, target, readouts, assay kit, etc. To help with the underlying data, we have created the Common Assay Template, which draws from a number of underlying vocabularies created by domain experts, including the BioAssay Ontology (BAO), Drug Target Ontology (DTO), Cell Line Ontology (CLO) and others. When text is available (e.g. 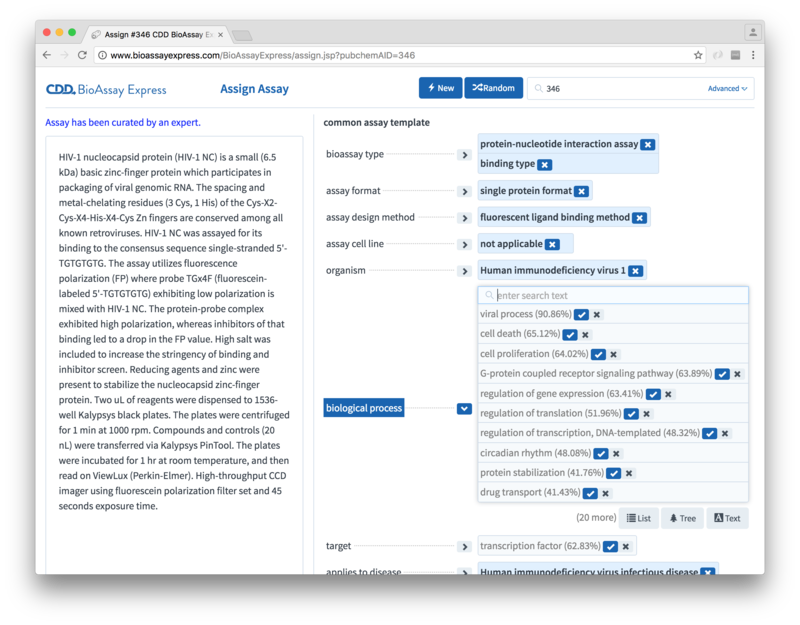 for annotating legacy data), the interface makes use of machine learning & natural language processing to suggest terms, speeding up the process. ... or here for a random assay that has yet to be curated.